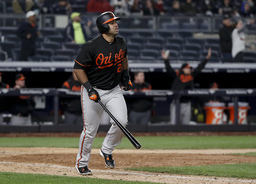 Pedro Alvarez may have provided the Yankees some strange mercy with his 14th-inning grand slam. "It's one of those when you exert everyone and you're losing guys like that, yeah, it hurts when you lose," Yankees manager Aaron Boone said. "It's hard," Orioles manager Buck Showalter said of the long night. "That's why it's the big leagues. Things are hard up here." "It was a little nerve wracking but having the MRI come back clean is a good thing," Sabathia said. Sanchez said the cramp happened all at once. He spoke with a doctor and will "wait and see how I feel tomorrow." "We were incorrect," Meals said. '"'We think he's fine," Boone said.